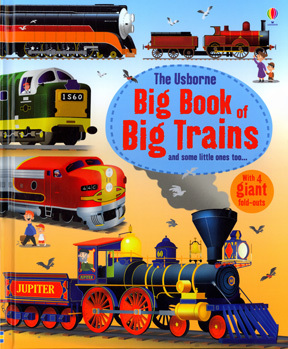 A fantastic book crammed with the world’s biggest and best trains. Young train enthusiasts will love learning about record-breaking trains, mountain trains, luxury travel, diesel power, steam giants, high-speed electrics and lots more featured in this great big book packed with stats and facts. Includes four gatefold spreads which open out to reveal the truly stunning types of the world’s trains. Hardcover, 9 ¾ x 12", 16 all-color pages, Folds out to 37½ x 12", eye-catching artwork. Ages 3 and above.